Once the industry leader in the custom bobblehead business, Whoopass Enterprises’ business had been declining for the past two years. With organic traffic down 75% and sales struggling, they were in need of a strategic overhaul to regain rankings and reinvigorate their business. LDM was able to stop the bleeding shortly after taking over, and within four months had turned things around and were seeing year-over-year traffic growth. Three months after that, it was at 80%, and then for the next year improvement was between 100-200%. #1 rankings on primary keywords were established and maintained, while overall sales more than doubled despite a declining overall market demand. Due to our pragmatic, big-picture approach to organic rankings and an overall marketing strategy, Whoopass has been on a growth trajectory for the past three years. We continue to build on this progress as we grow their online search presence by finding new targets, diversifying their promotional strategies, and taking a comprehensive approach to finding solutions. Whoopass Enterprises was an industry leader in custom bobbleheads for years. They had dominated the top of rankings and saw a lot of success as an industry pioneer. Recently, however, rankings had dropped. Between increased competition and website penalties, the traffic and sales generated from the website were a fraction of what they had previously been. Traffic was just 25% of what it was five years ago (image 1). Similarly, ranking had seen a similar drop. Despite historically ranking in the top 3 for major keywords, they had dropped down the first page, and most recently had either been deindexed or sank below traffic-generating positions altogether. With struggling sales and low rankings, they turned to us to solve their search issues. We took over the organic effort from the ground up, setting up a long-term plan to regain rankings and bring Whoopass Enterprises back up to their former position. We started our process by completing a comprehensive SEO audit to get a complete understanding of targeting, on-page and technical issues, as well as the backlink profile and previous strategies. Due to these findings, we developed an approach to address problem areas and maximize effectiveness. The website had been the same for a number of years and had since grown outdated. We shifted the structure to focus on high-priority pages, fixed crawling issues, improved sitespeed, improved mobile performance, and set up an internal linking structure to pass more value between pages. While the technical issues we solved early in the process were more substantial, improving sitespeed has a positive impact on search potential as well. 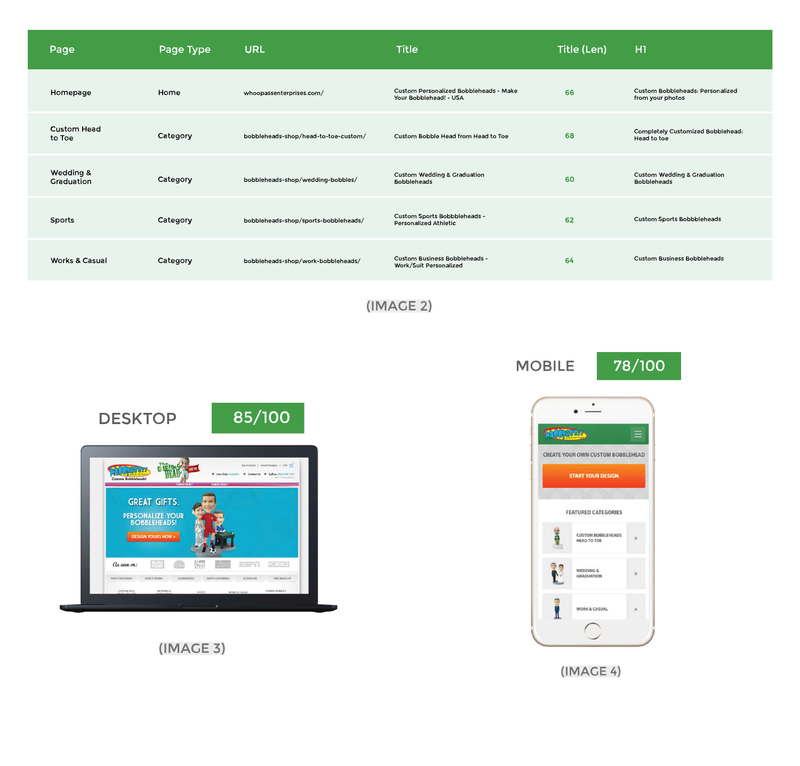 We improved effectiveness from 32/100 for mobile and 44/100 on desktops to much more respectable numbers. Due to some website scripts we weren’t able to push higher, but this effort removed potentially debilitating effects from extremely poor page speeds (image 3 & 4). The early 2010’s were some rough times for websites exploiting ranking algorithms. The former SEO company for Whoopass Enterprises was one of them. They had employed some questionable strategies, which we were able to identify during the backlink review audit. We undertook the tedious task of evaluating backlinks, removing as many as we could, disavowing, and submitting requests for a manual review. In conjunction with removing bad links, there was an obvious need to diversify the backlinking strategy. By setting up more of the major social & business profiles, updating them frequently, and promoting website content through these channels, we were able to get more content indexed more quickly and build authority to branded presences. As the SEO effort progressed, we started to blog on the website more frequently, redesigned the blog for better effectiveness, lead generation, and internal linking, and promoted content on other websites as well. The nice thing about working with a company like Whoopass Enterprises is that they’ve got a fun product that spans a number of verticals. It’s relevant to people looking for everything from retirement and coaching gifts to wedding and birthday gifts. We leveraged this opportunity by finding promotional partners across a number of industries, co-promoting products and events, and sponsoring giveaways and contests with products. Not only were we able to establish great PR pieces this way, but we used our SEO knowledge to leverage the effectiveness of these efforts as well. Early in the optimization process, we create an onsite plan to optimize tags and content on each page. After the research phase, we map keyword targets to each major page on the site, then recommend changes on everything from Title’s and H1’s to URL’s and content. We then executed these changes directly on the site in an effort to see relatively fast improvements. The old blog had a lot of problems with it. It was a WordPress install that hadn’t been updated in years and was barely able to function. Key SEO elements such as titles weren’t editable, there were no H1’s, and there was no internal linking, not to mention that it was just default theme without any customization to help nurture sales or engage users. The new blog (image 5) fixed all of those issues, improved social sharing features, made the blog more attractive and readable, and focused on getting users to further engage with the website. It provided us with a platform to not only drive additional long-tail organic traffic, but also as an effective area for promotions, contests, and featured content. The improved blog effectiveness and functionality was a major marketing piece that we utilize in growth efforts moving forward. With a new season of The Walking Dead approaching, we thought it was a great opportunity to promote the Whoopass Zombie Bobblehead product line. We found several fan blogs, websites, and podcasts and did a variety of different promotions. One of our favorites was with “The Walking Dead Enthusiasts” where we gave away a free custom zombie bobblehead to one of their podcast subscribers via their blog. Recovering from a penalty can make results measurement a bit difficult. 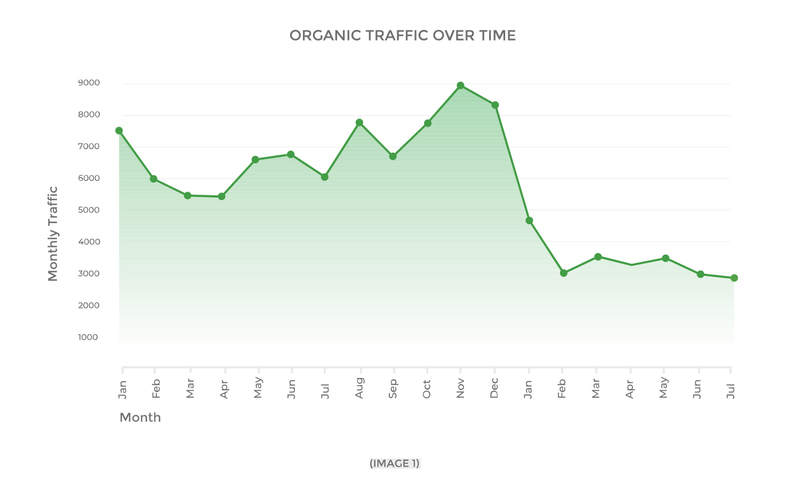 We used historical data to adjust for seasonality, trends to adjust for industry volatility, and then set up expected organic traffic numbers based on the previous months’ organic search numbers and the adjustments. The result was a fairly adjusted year-over-year organic model that could accurately benchmark our progress. When we talk results, we like to talk about traffic, sales, and revenue, like in the chart above. Due to the nature of the custom gift business, the direct revenue numbers aren’t as straight-forward as typical e-commerce purchases (because they often take multiple visits or phone calls), but suffice to say we track overall results as well. On top of this, we of course check rankings to find areas of opportunity and improvement. 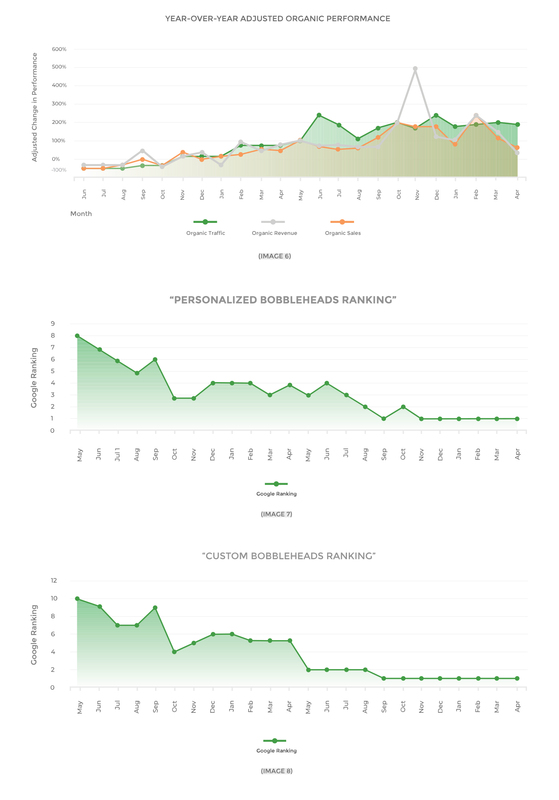 Here’s the historical chart of rankings for our primary keyword target, “custom bobbleheads” (image 7). Continuous improvement, and results that stick. 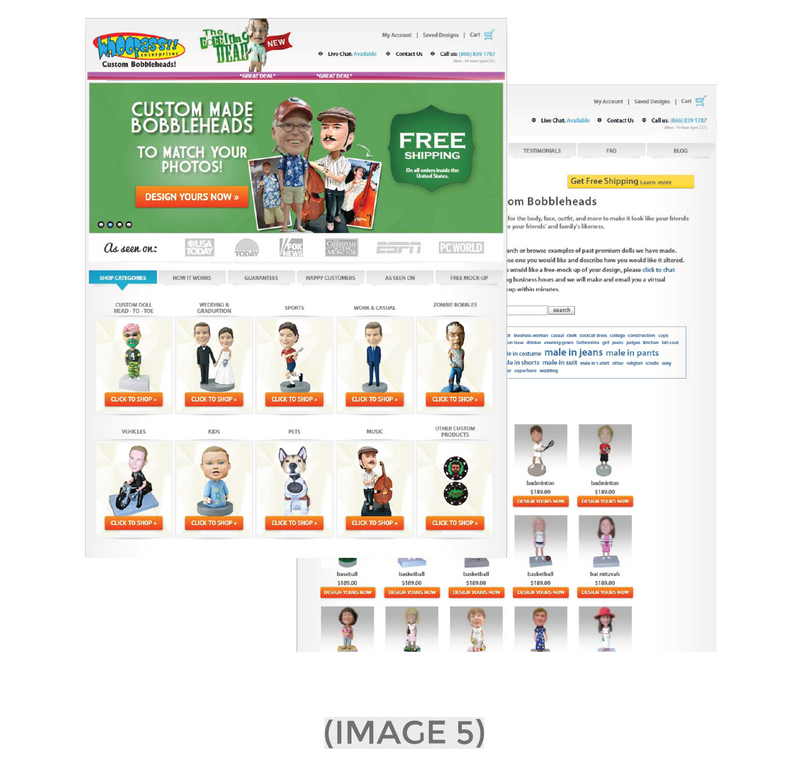 “Personalized bobbleheads” was our secondary target (image 8). While those are our two primary targets, we actively track dozens of keyword variations on an ongoing basis in addition to monitoring search exposure reports for opportunities. It isn’t about targeting a specific keyword so much as it is improving website strength for all related keywords in the niche. So we see more of a “rising tide” effect that lifts all related keywords rather than sniping certain keywords and completely ignoring others.